Basketball is just a game, like hockey or baseball or soccer. Each has its peculiarities and we assume they are not as serious as business. But one thing they have in common is that business involves a group effort that can be optimized with co-operative energy. Of course at its highest level sports are business enterprises trying to maximize revenue and minimize expenses. Phil Jackson is unusual in his approach to coaching. A lot of people would consider him weird with his emphasis on spiritual matters and others attribute his success to the luck of having Hall of Fame players to guide. 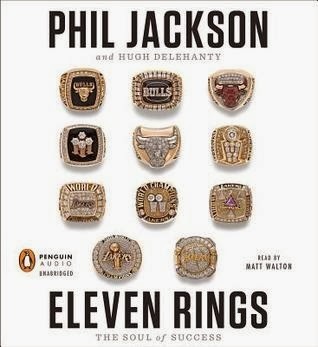 Bottom line, he has participated in more NBA championship winners than any other person--11 of them referred to in the title. Phil was born in a remote community in Montana and played high school and university basketball in North Dakota. Like almost anyone who makes it to the NBA he was a key player at the high school and university level and used to getting a lot of attention. But he was not a superstar and had to learn to blend in with others with more talent. As a player he won one championship while a reserve player and actually was off a whole season due to an injury when the New York Knicks won a second championship. The injury gave him the opportunity to work with coach Red Holzman who he credits with teaching coaching basics. In Phil's mind, the NBA has become too glamorized with the marketing strategy concentrating on celebrity players. This has made too many players shoot for glory rather than fitting in with a team to optimize their effectiveness..
With talent comes a lot of ego. Can you imagine players like Michael Jordan and Kobe Bryant? Or Dennis Rodman? Or Shaquille O"Neal? They were all capable of critical contributions, but they also could demotivate others that were capable of blending their talents towards victory. Coaches were constantly dealing with the others who felt they were not getting a fair chance. Phil was fortunate to associate with wealthy club owners, but they all had problems with melding expensive talent to expected championships. Two of his greatest players, Michael Jordan and Scottie Pippin once felt threatened by the Chicago manager drafting a European player, Toni Kukoc and overpraising him. They ganged up on Toni at the Olympics, but later teamed up with him under the guidance of Phil. All three players contributed to a championship ring. Kobe Bryant came straight from high school with more talent than almost anyone and an exceptionally developed ego. He resented anything that did not revolve around him getting the shot. Phil teamed him up with Shaquille O'Neal, one of the most physically dominant centers of all time and used to getting a lot of attention. It was a long time before they became buddies. Phil studied psychologist Carl Rogers who believed it was virtually impossible for anyone to change unless they thoroughly accept who they are. Before a game, especially a tough one it is common for coaches to try to rouse up their players' emotions, but Phil preferred to try to quiet their minds. He encouraged his players to meditate and practice mindfulness. Yoga and Tai Chi were on his agenda. He also took from Lakota Indians, including their way of handling anger. From Red Holzman, "Practice doens't make perfect. Perfect practice does." Red also realized the importance of bench players and made a point to warn them when they would be expected to play and to watch the 24 second clock so they wouldn't be caught off guard. Phil comments that a lot of details are just as important as the ones that get recorded. An example is the assist which is awarded to the player who makes the pass that leads to a score. He feels the pass that leads to the pass that leads to a score is just as important. His approach to basketball is unique. He was fortunate to have the physical and mental requirements to be a professional basketball player and wise enough to learn how to get others to achieve great success on the court and to find greater meaning in life.